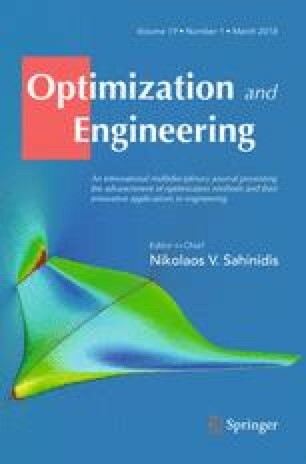 We consider engineering design optimization problems where the objective and/or constraint functions are evaluated by means of computationally expensive blackboxes. Our practical optimization strategy consists of solving surrogate optimization problems in the search step of the mesh adaptive direct search algorithm. In this paper, we consider locally weighted regression models to build the necessary surrogates, and present three ideas for appropriate and effective use of locally weighted scatterplot smoothing (LOWESS) models for surrogate optimization. First, a method is proposed to reduce the computational cost of LOWESS models. Second, a local scaling coefficient is introduced to adapt LOWESS models to the density of neighboring points while retaining smoothness. Finally, an appropriate order error metric is used to select the optimal shape coefficient of the LOWESS model. Our surrogate-assisted optimization approach utilizes LOWESS models to both generate and rank promising candidates found in the search and poll steps. The “real” blackbox functions that govern the original optimization problem are then evaluated at these ranked candidates with an opportunistic strategy, reducing CPU time significantly. Computational results are reported for four engineering design problems with up to six variables and six constraints. The results demonstrate the effectiveness of the LOWESS models as well as the order error metric for surrogate optimization. All the authors acknowledge the partial support of FRQNT Grant PR-182098; B. Talgorn and M. Kokkolaras are also grateful for the partial support of NSERC/Hydro-Québec Grant EGP2 498903-16; such support does not constitute an endorsement by the sponsors of the opinions expressed in this article. B. Talgorn would like to thank Stéphane Alarie of IREQ, Patricia Gillett-Kawamoto of GERAD and Sylvain Arreckx of GERAD for their invaluable insights and comments.